Recent years have proved that if you want to look for which countries are adopting innovative digital governing solutions, you don’t look at the usual tech suspects like the US or Japan. You look to Estonia. Estonia, being a country of approximately 1,3 million people has in recent years really set the agenda for how you govern a country digitally. Their ideas within e-governance, digital policies, and national cryptocurrencies have created headlines all over the world and shifted the lens of the media to pay close attention to what is buzzing in this small state in the Baltics. Estonia has also caught the interest of its fellow small state neighbors. One of them is the Faroe Islands, a tiny Nordic country with 50,000 inhabitants, which is now embarking on a similar journey as Estonia. Their goal is to create a fully-fledged digital infrastructure by 2020. The technicalities of this project are novel and innovative on its own, but it’s just as much the symbolic part of a project like this that is important. 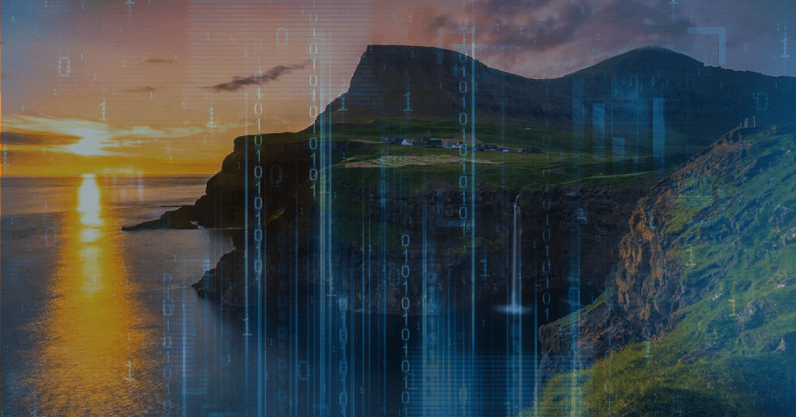 With this project, we are creating a digital infrastructure in the Faroe Islands. The country’s physical infrastructure has changed significantly for the better, but the “maybe” mentality still prevails. Kristina Háfoss believes that by implementing a thorough digital infrastructure, the country will no longer be the land of maybe, but the land of tomorrow. For many years, the Faroe Islands have struggled with a declining population. Especially young, educated people have not been returning to the country, after having sought education abroad. This pattern is already changing, and Kristina Háfoss believes that the project Digital Faroe Islands will only reinforce that pattern. Nicolai Mohr Balle is the head of the project Digital Faroe Islands. He explains that the idea of how to design the Faroese digital infrastructure is heavily inspired by the Estonians. The infrastructure is built on four main pillars; the service portal, the digital identity, the interoperability system X-road and the basic digital registries. What seems most basic is the service portal, from which you can handle your public administration. You can take care of everything from there. Banking, doctor’s appointments, applications for rodent extermination, buying a house, or applying for university. Everything is accessible through the same portal with the digital identity. What makes it especially effortless, Nicolai Balle explains, is the fact that the citizen won’t have to enter his or her information for every different appointment or application he or she has to make. Once you’re signed in, the system takes care of providing your details. This sounds effortless, if not a bit precarious. But Nicolai Balle assures me that the exchange of personal data on this platform is entirely safe and decentralized. The service portal is run on the interoperability system, X-road, which is an Estonian invention. The X-road is basically a data platform, which links individual servers through end-to-end encrypted pathways. This assures that the information always remains local. The X-road was a platform built for the Estonian government, but since its invention, other countries have also adopted it. Among them is the Faroe Islands, but also Finland, Namibia, and Azerbaijan. When the X-road is used in many different countries, this also creates opportunities for accessing services internationally. The digital identity is used as your digital signature. The ID will comprise of a username and a password that you have to enter and verify with your private key, which is placed on an app on your phone. This solution is compliant with the EU eIDAS regulation on electronic identification. This means that over time, the local Faroese digital identity can also be used to access services from other EU countries. The former president of Estonia, Toomas Hendrik Ilves, has been quoted to tell a story of a book he once read about how computerization would be the death of work. The book used an example from the American steel mill industry, where automatization had made thousands of former workers redundant and only left a few hundred workers left. The writer of the book might have thought it painted a picture of a drab future, but Ilves immediately saw that computerization could mean the beginning for small countries to fully maximize their potential. Ilves has since publicly urged other countries to follow Estonia’s example and make the digital shift. Kristina Háfoss also sees huge potential in digitalization for small countries. You know it’s easier to turn a speedboat around than a supertanker, and this is the strategy and driving force for making the Faroe Islands a role-model in e-governance. In a small society, things are simpler. In the legal framework, in government and in general. Just the fact that we have fewer systems by being small creates much less legal work and our ability to leapfrog to new solutions. That’s why I believe the Faroe Islands can become world class competitors on e-governance, and a truly digitized society, providing us with competiveness in an ever-increasing globalized world. Being a small country can manifest itself in a lot of anxiety and lack of self-esteem. But it seems like digitalization and e-governing are proving to be the rock which David uses to beat Goliath. Estonia is already running in the front. Now let’s see if the Faroe Islands can run next to them. The ambitions are certainly there.